Are you interested in the overlap between technology, art and design; and free, open, libre tools that join these domain? Do you use Libre Graphics software like GIMP, Blender, Krita, Inkscape, Scribus, MyPaint (and similar), and want to meet the people behind them? Are you a developer of free and open source software in the areas of photography, graphics, page layout, design, publishing, typography, animation or video? Come to the 8th annual Libre Graphics Meeting, from Wednesday 10th to Saturday 13th April in Madrid, Spain! Registration is open (no attendance fee, sponsorship possible), and presentation & workshop proposals are accepted until 15th of February (2 weeks from today!). Following the Piksels & Lines research meeting in June and being accepted in the call for proposals I am now taking part in the Piksel & Lines Orchestra residency, hosted by Piksel and LGRU, together with media artist and engineer Brendan Howell. 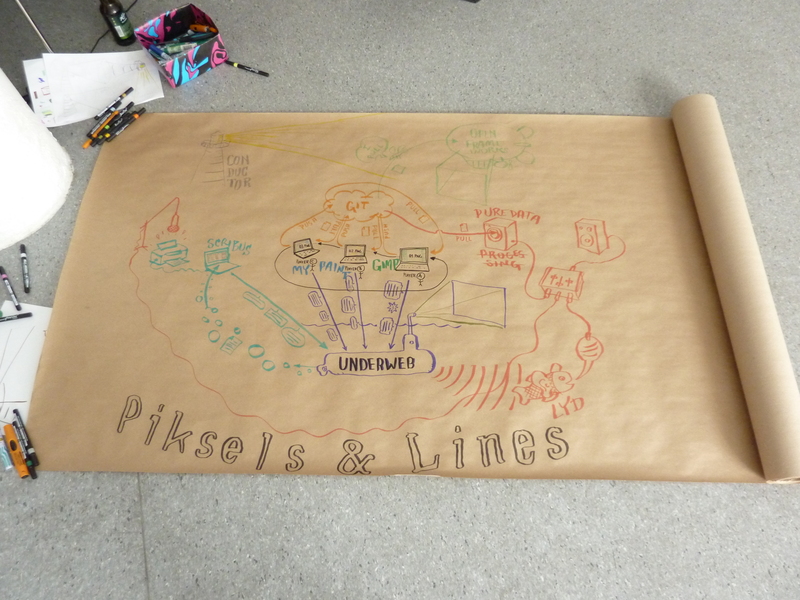 Together we will further develop the Piksels & Lines Orchestra, a system that turns the traditional libre graphics tools (like MyPaint, GIMP, Inkscape, Scribus) into instruments for use in an performance setting. A prototype of this system is to be demonstrated at Piksel X in Bergen, November 21-25th. Piksel is an annual festival where artists and developers working with free and open source software, hardware and art come together. Its diverse program will include presentations, workshops, performances, and installations. Within the Piksels & Lines Orchestra residency we will also realize an artwork that will be performed in Madrid, April at the Future Tools Conference. 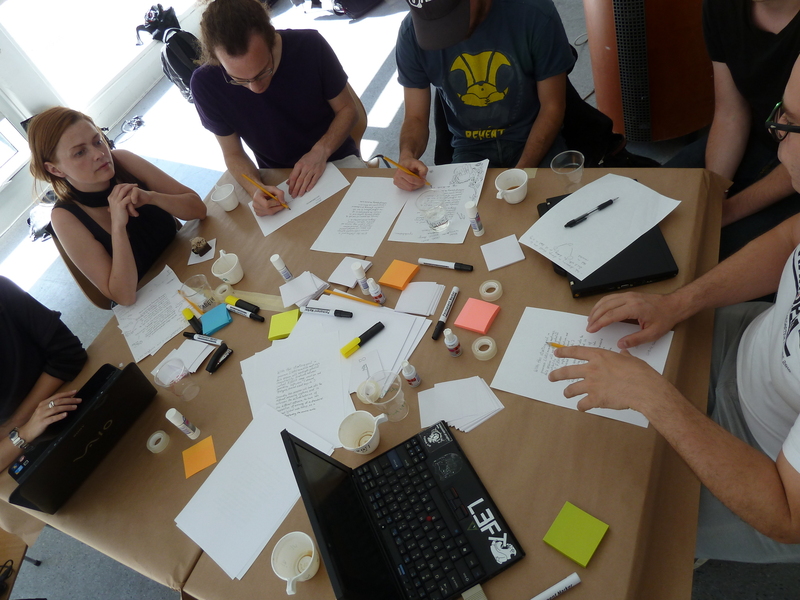 This event combines Libre Graphics Meeting, an annual artist and developer meeting around free and open source graphics software with Interactivos?’13, two weeks of project-centric workshops focused on collaborative creation using open hardware and open software. The call for projects is now open, focusing on “Tools for a Read-Write World”. Don’t miss any of these events if you are interested in the intersection and interaction between artistic works and open tools! Last week I was so lucky as to attend the 3rd Libre Graphics Research Unit (LGRU) meeting in beautiful Bergen, Norway. The meeting was structured into three different areas: Seminar, Workshop and Performance. The attendants that were invited for the meeting each did a presentation of their choosing. They were recorded and are available in the online archive of the seminar. The video quality leaves something to be desired, but the audio is generally good. 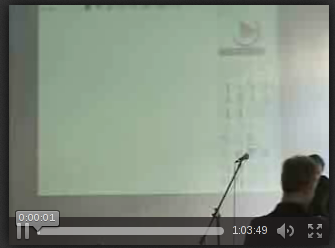 Egil Möller on the real time collaborative annotation tool Sketchspace based on Etherpad. Ana Carvalho from Manufactura Independente on combining old school plotters with modern vector graphics and typography. Chris Sugrue on her work on interactive art installations and the EyeWriter project that allowed ALS-struck graffiti artist TEMPT to draw again. I gave a presentation titled MyPaint and cross-application workflows. It was an introduction to MyPaint as a creative tool, how it combines raster and vector (piksels and lines) concepts, and my perspective on interoperability between libre graphics applications. I had hoped to hack some code for one of my existing ideas during the workshops. That did not happen. Instead I ended up hacking specifications. Maybe that is just as good. Hacking one can always do later, hashing out and documenting ideas has to be done while it is fresh. A strategy for improved file format support in GEGL, and using this to improve file support and interoperability in libre graphics applications. Proposed plan. Executing this plan would move a lot of the existing file format support from GIMP (PSD, XCF, OpenRaster) down into GEGL so that it can be reused across applications. And would then let GEGL provide image support plugins for GdkPixbuf and QImage – so that at the very least – previews will work everywhere. Refining here means that the user guides the tool to transform freehand sketch into vector paths, then into vector shapes, then into something domain-specific and formal like UML – by adding additional data like annotations, strengthening of lines to “disambiguating” the transformation. Needless to say, this is more a visionary thing. Realizing this would involve finding good solutions to a fair amount of computer vision problems. Making GEGL available for use in web-based applications. Proposal. Some of the discussions also resulted in me writing down the strategy for GEGL integration in MyPaint and the related ideas/plans for how to improve the performance of the MyPaint brush engine. Now we just need to implement all the stuff… Contributions welcomed! Since Piksel, with a long history in generative performance arts, was the hosting organization it was not surprising a project in that area materialized. 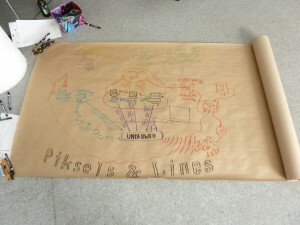 A workshop session hosted by media artist Brendan Howell called Demonstrating the Unexpected came up with the idea of the Piksels & Lines Orchestra (PLO): think of the collaborative use of our traditional libre graphics software as an orchestra. The applications, from MyPaint to Scribus, are instruments; the people using them players; a performance the use of these instruments. Can we create an experience for an audience based on this framework? How would it sound? How would it look? Architecture diagram - no need for them to be dull looking. Thanks a lot to Piksel and LGRU for sponsoring my attendance, and the EU Culture Programme and Bergen municipality for funding activities that support libre graphics and free culture!